Valve has announced the first piece of downloadable content for Left 4 Dead 2 called "The Passing." It takes place just after the Dead Center campaign of L4D2 and is set in a small town in rural Georgia. 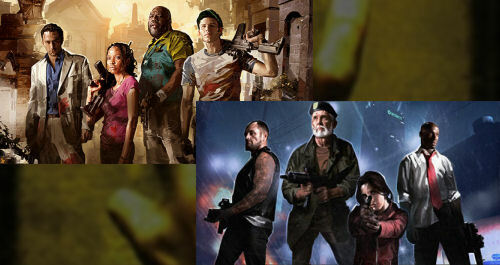 Players assume the role of the L4D2 Survivors as they meet with the L4D1 characters of Bill, Zoey, Francis, and Louis. Awww, group hug. Along with the new co-op campaign The Passing will add more arenas for Scavenge, Versus, and Survival as well as a brand new co-op mode. There's even promise of new weapons and uncommon infected. There's no hint as to what the new co-op mode will be, but since the game already has it's "Survival" mode my guess is it won't be in that style of gameplay. Perhaps we'll see something completely new and fresh? My vote is for a Chicken Fight co-op mode. As of now, The Passing is set to be released in early Spring of 2010.